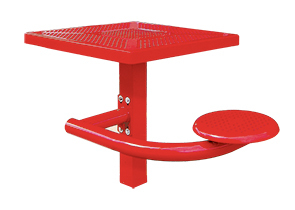 Offer quaint high volume seating with the single pedestal canteen table—great for food courts, outdoor cafes and patio service areas. Reliably constructed with 12-gauge precision punched perforated steel that's engineered ready for all-season enjoyment. The elevated seat design provides the perfect amount of room for easy in/out maneuvering as well as fast clean-up under the 30"Sq. table tops. The 4" steel pedestal frame is MIG welded for superior support and the state-of-the-art finish is available in a variety of color options to meet aesthetic guidelines.